It’s important for your child to stay active and get fresh air, regardless of the season. 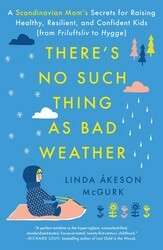 In order to make sure you and your little one are prepared for the winter months, Linda Åkeson McGurk, author of THERE’S NO SUCH THING AS BAD WEATHER, shares tips to make sure everyone is warm, comfortable and happy. A comfortable child can play outside for hours, so high-quality outdoor gear and play clothes are well worth the money. If the clothes are durable, chances are they can also be handed down to younger siblings. Layering clothes is key to keeping children warm in cold temperatures. The first layer, or the base layer, regulates the child’s temperature and keeps him dry. This layer usually fits snugly. Long underwear made from merino wool, synthetic fibers, or a blend of both works best closest to the body, since these materials move perspiration away from the body. Cotton, on the other hand, soaks up moisture and leaves the child feeling wet and cold.The mid-layer insulates the body by trapping body heat in pockets of air in the fabric. This layer can be made of either natural or synthetic fibers and can, for example, consist of a fleece jacket and pants or a sweatshirt and sweatpants. The outer layer should be waterproof, windproof, and breathable. This layer also needs to stand up to some wear and tear and is typically made of polyamide or nylon, preferably with reinforced high-impact areas like knees and bottom. For the youngest children, one-piece coveralls are usually the best choice, since they are easy to put on and prevent snow from creeping in. Underfoot straps help keep the coveralls/snow pants in place, and reflective trim or a high-visibility vest are a must for outdoor adventures after dark. Combine with snow boots or fleece-lined rain boots, as well as waterproof mittens with long cuffs, and a hat. The same layering principles apply as for winter, but with lighter or fewer layers. For rainy days, the Scandinavian-style heavy-duty rain gear sometimes seen at forest schools in the US is the ultimate outer layer. Typically sold as a set consisting of overalls (bib pants) and a jacket, and made of polyester and polyurethane blends, these garments do a great job of keeping wind and rain out. Layer them with a fleece jacket in cooler temperatures and combine them with a pair of rugged rain boots for endless fun in puddles of mud. For dry days, use regular, breathable shell pants and a windbreaker for the outer layer. Even if the temperature doesn’t call for shell pants, they save your child’s regular clothes from getting stained and torn. Make a mental breakdown of your child’s wardrobe into “playclothes” and “school clothes” to avoid stressing over. Damage wrought by messy outdoor play. Hand-me-downs, yard sale finds, and older clothes with holes or stains that won’t come out make excellent candidates for playclothes. In cool, wet weather, layer with rain gear as needed. Planning a hiking trip with your little one in the summer? Check out these helpful hiking tips. “A perfect antidote to the hyper-vigilant, extra-electrified, standardized-tested, house-arrested, 21st-century childhood.” —Richard Louv, bestselling author of Last Child in the Woods and Vitamin N Bringing Up Bébé meets Last Child in the Woods in this lively, insightful memoir about a mother who sets out to discover if the nature-centric parenting philosophy of her native Scandinavia holds the key to healthier, happier lives for her American children.When Swedish-born Linda McGurk moved to small-town Indiana with her American husband to start a family, she quickly realized that her outdoorsy ways were not the norm. In Sweden children play outside all year round, regardless of the weather, and letting young babies nap outside in freezing temperatures is not only common—it is a practice recommended by physicians. In the US, on the other hand, she found that the playgrounds, which she had expected to find teeming with children, were mostly deserted. In preschool, children were getting drilled to learn academic skills, while their Scandinavian counterparts were climbing trees, catching frogs, and learning how to compost. Worse, she realized that giving her daughters the same freedom to play outside that she had enjoyed as a child in Sweden could quickly lead to a visit by Child Protective Services. The brewing culture clash finally came to a head when McGurk was fined for letting her children play in a local creek, setting off an online firestorm when she expressed her anger and confusion on her blog. The rules and parenting philosophies of her native country and her adopted homeland were worlds apart. Struggling to fit in and to decide what was best for her children, McGurk turned to her own childhood for answers. Could the Scandinavian philosophy of “there is no such thing as bad weather, only bad clothes” be the key to better lives for her American children? And how would her children’s relationships with nature change by introducing them to Scandinavian concepts like friluftsliv (“open-air living”) and hygge (the coziness and the simple pleasures of home)? McGurk embarked on a six-month-long journey to Sweden to find out. There’s No Such Thing as Bad Weather is a fascinating personal narrative that highlights the importance of spending time outdoors, and illustrates how the Scandinavian culture could hold the key to raising healthier, resilient, and confident children in America.